Selina D'Arcey is blind, yet she sees the world anew through the eyes of kindly Gordon Ralfe (Academy Award® winner* Sidney Poitier). An awkward Cinderella raised by a bigoted, abusive mother, Selina is white. She does not know that the man helping her learn to dial a pay phone or find the restroom is black. Elizabeth Hartman's luminous screen debut as Selina earned her a Golden Globe® Award as Most Promising Newcomer. 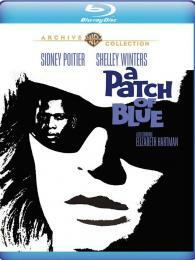 On the veteran side as Selina's blowsy, bitter mother, Shelley Winters won her second Oscar.®** As directed by Guy Green (Oscar®-winning cinematographer for Great Expectations, 1947), the performances are timeless in A Patch of Blue. So is this fine film's heart-soaring impact. • Featurette "A Cinderella Named Elizabeth"